For the first time since 1999, the Standard & Poor’s 500 Index is being reconfigured. The last time was when technology was established as an independent sector. The current reconstitution of the S&P 500 involves breaking out real estate investment trusts (REITs) from the financial industry group. This is worth paying attention to, given how rarely these sorts of structural changes occur. Because of the unique characteristics of REITs — most income is passed through tax-free as dividends — it makes sense to categorize REITs separately from banks and brokerages. The big concern to my contrarian eye is the timing. The appeal of REITs is their high dividends in an era of low bond yields. However, these changes are occurring just as the Federal Reserve is on the verge of raising short-term interest rates. The timing of the overhaul could easily prove later to have been problematic. among the bull market’s best performers . . . The number of publicly traded REITs has also risen. Since 2001, 129 real-estate investment trusts have gone public in the U.S., raising more than $38 billion, according to Dealogic. There are roughly 240 REITs listed on the New York Stock Exchange and the Nasdaq, according to S&P Dow Jones Indices. The reasons to move REITs out of the financial sector have been true ever since REITs were created in 1960. The S&P 500 could have been altered to distinguish between finance and real estate anytime during the past few decades. Let’s consider a few reasons why this is happening now, and what it might mean. Any contrarian should note this as a potential problem. 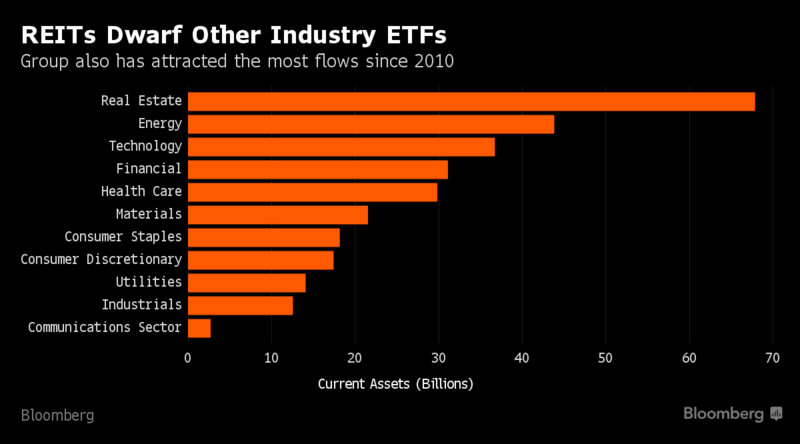 REITs havealready been huge winners, especially through ETFs. It’s a hot industry that has attracted lots of capital, and is now getting its own sector. That raises the fair question of whether the guardians of the index universe are late to the game. It wouldn’t be all that unusual if it were. The last time S&P added a new sector was in 1999, when technology was separated from industrials. That was right before the huge dot-com run ended in March 2000. It took 13 years for the tech sector to return to those highs. We saw something similar when the keepers of the Dow Jones Industrial Average added Microsoft, Intel and more recently Apple to the index. The timing of those admissions represented high-water marks for the shares of those companies, and after they fell it took a long time for them to surpass those highs. Does this mean, that “this once-niche asset class is all grown up and ready for a far more prominent role in investors’ portfolios,” asInvestors Business Daily recently asked? Or is this a sign of impending doom for REITs, ETFs and other forms of passive investing? I suspect a reasonable interpretation is somewhere in between. Often, we see major changes like this associated with market tops and bottoms and subsequent major reversals. We saw it with gold, bear markets, the economy, real estate (check Time and Fortune) andmany other events. I have been studying questions surrounding contrary indicators for a long time. Why do these events so often mark tops? Investors need to consider not merely any specific event but rather the longer-term forces that allowed it to occur. There is, of course, one caveat here: It is dangerous to put too much weight on any sample set of one. That’s something to keep in mind when focusing on this single event.